Who doesn’t love strawberries?? Well, actually, me as a small little boy … I know I’m weird, right? Nonetheless, all is good now and even I now love the sweet aroma of fresh juicy strawberries. Strawberries just make for the perfect refreshing dessert in the summer, especially when served as a fruit salad. This is not your ordinary fruit salad though! Get ready for bold and exciting Asian flavors that perfectly complement the delicate sweet taste of the strawberries. About 10 years ago I came across a recipe for a strawberry fruit salad with basil and balsamic vinegar. This combination sounds unexpected but it’s absolutely delicious! I wanted to give this a little twist and incorporate some Asian flavor. Instead of using regular basil I use Thai basil for this one. Thai basil has bit more spiciness to it as well as a slight anise-like flavor (almost a little licoricey). Lemongrass, on the other hand, has a pungent citrus flavor and intoxicating aroma. It can be eaten raw, but it is very fibrous making it tough and difficult to chew. Most of the flavor is in the natural oils, hidden in the stalks. The best way to get the flavor out is to simmer it in liquid. Both of these taste-makers work just perfectly with the taste of juicy strawberries. The sesame seeds give it a light nutty finish. Did you know that strawberries also pair really well with goat’s cheese? The sweet and lightly acidic taste of the strawberries perfectly counterbalances the rich and hearty taste of the goat’s cheese. Check out this and other delicious flavor combinations in my new book Flavor Math. The book is available now digitally (PDF)! Give this delicious strawberry salad a chance. You will surely not be disappointed and amaze your guest with this unexpected but luscious combination! Turns out that Japanese veggie cutting cleaver also works perfectly for delicate fruit! Make a delicious dressing, slice up some strawberries and you are already done! Cut the lemongrass into 3 pieces and bruise them with a pestle, rolling pin or the handle of your kitchen knife. Juice the oranges and pour the juice into a small saucepan. Add the lemongrass, brown sugar and cider vinegar. Bring to boil, turn heat to low and let simmer for 5 minutes. Take out the lemongrass and discard it. Pour the dressing into a large serving bowl and let it cool down. In the meantime, cut the strawberries into thin slices. Add to the bowl with all the juices that came out while cutting. Place the Thai Basil leafs on-top of each other, roll them up like a cigar and cut into very thin strips. Toss to combine, sprinkle with the toasted sesame seeds and serve immediately! 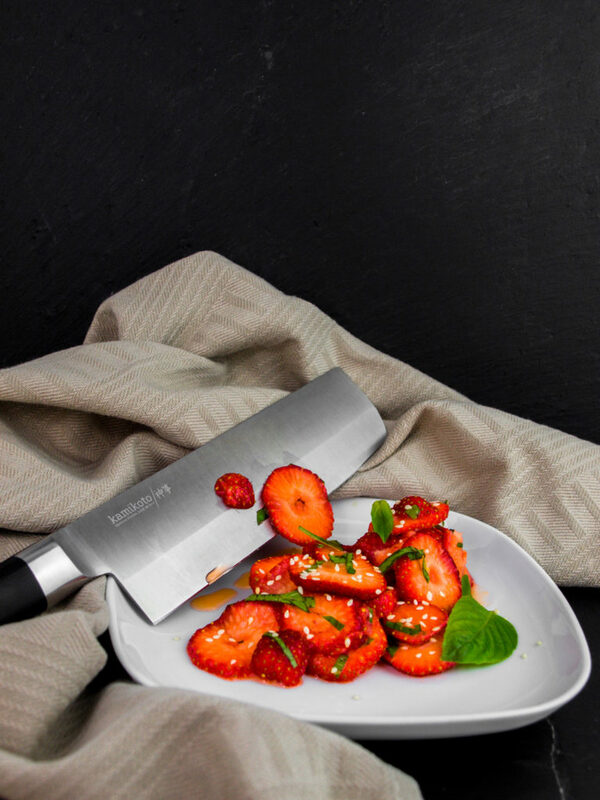 Have you ever tried strawberries with regular- or Thai basil before? Are there any other delicious Asian twists on fruit salads that you know? Share your thoughts and suggestions with us in the comments below! PS: This recipe is inspired by the idea that strawberries share chemical flavor compounds with orange, lemongrass, and Thai basil. That’s why they work so well together. Check out James Briscione’s book The Flavor Matrix on food pairing if you are interested in digging deeper into this!